The struggle with identity can seem very real in high school. The social groups, the pressure from parents and teachers, a lot of weight is put into “being yourself” at a time when you really can’t know who you are. 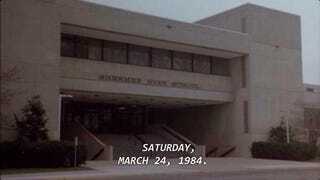 So John Hughes classic starts with our 5 characters entering the library for detention dressed like their roles. The principal gives them one goal for the saturday: write an essay on who you think you are. The course of the story is about giving us two seperate narratives-the emotional release of expressing how much pain these groups they joined cause them and this enlightening narrative about whether they can actually break out of these roles. In the end they answer the question with a question with another question stating they know they’ll be seen as the most “convenient” version of themselves, a brain or jock or whatever, but that they’re all of them all of these things. The middle of the episode is basically everyone getting to try on another’s role for a bit, they all run from the principal like criminals, they smoke pot and party like cool kids, the brain admits he’s as much a basket case as anyone. The movie ends with a cool song and a sense that even if the world is mixed-up and we’re mixed up we got to be ourselves and isn’t that cool. Teens are so cool. The difference between comedy and tragedy might be how long the camera stays on the characters. The pressures the kids in Breakfast Club have are still on them the next monday when school kicks back in. The ones who are trying to go to college are still dealing with that, the ones who have problems with their parents are still going to have problems with their parents. The problem is what Sartre might call the look. You look at me and say “that’s a cool jock” and so I become more of a jock. He believed we objectified people and that these people, when seeing how much power they had as objects, would do what they could to get that look from other people. The Breakfast Club deals with the problem of young people dealing with this problem. The problem isn’t in a role so much as giving up on your own subjective experience. In the Breakfast Club they admit this, in their final reply, that they accept that they have experiences that don’t match with their type, but we don’t really expect their lives to drastically change. What makes the movie so loved is that it ends before the reality sets in that they haven’t escaped at all. The social changes they experienced were just from being in this new group and falling for a new look. They might go back to normal when school starts again but throughout the course of a person’s life they have this moment many times over, the moment where you can try to be something new to someone else. Though I might say the kids are doomed the film gives us the blueprint to escaping to an experience that more closely matches our subjective ones. If anything the Breakfast Club shows us a high school experience where teenagers deel with tremendous pressure and find little actual solace from the weight on their shoulders. Everybody is just stuck there like they have no choice in the matter. The only real release from this is the idea that we can eventually escape this particular prison for one of our own making. Or that we could truly break free from these feelings and attempt to live life on our own terms not apologizing for our own choices like an exitential Steve McQueen.